Boston Gerard D'Aboville is an experienced navigator -- he's rowed alone across both the Atlantic and Pacific oceans. He's accustomed to monitoring the wind and the current. But as the captain of the Turanor PlanetSolar, the world's largest solar-powered boat, he's had to factor in something else: the sun. And he marvels at its power. "I can feel it some days," D'Aboville said on a recent overcast day, while the solar ship was docked in Boston Harbor. "It's a lot of energy." Even with the fog rolling in off the water, hiding the tops of Boston's tallest buildings, the ship's 30,000 photovoltaic cells were busy taking in the rays. "Today we are producing some electricity but we could produce four or five times more if it was sunny," D'Aboville told CBSNews.com, pointing to a monitor on his dashboard that indicated the kilowatts per hour generated by the boat's shiny black sundeck. That energy supplies the boat's eight-and-a-half tons of lithium ion batteries. Which answers a key question about any solar vessel: What happens at night? "We can go without sun for 72 hours. Depends on what speed, if we go fast we do not have the 72 hours." And there's the catch, or at least one of the catches, with this boat. 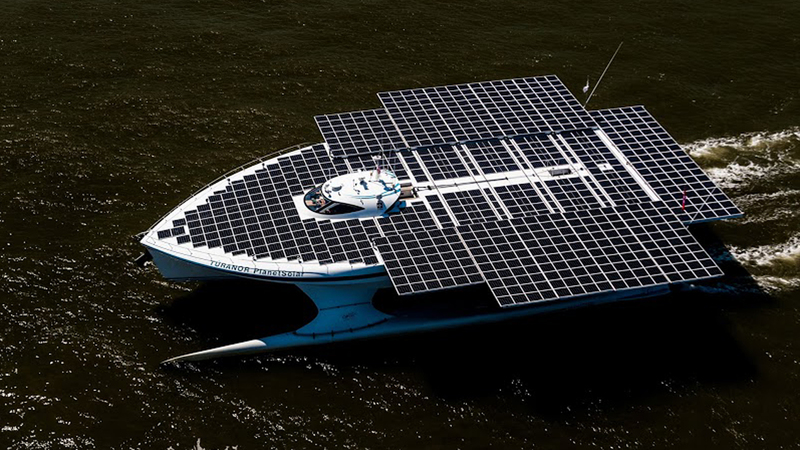 In 2012, the 100-ton catamaran became the first solar-powered boat to circumnavigate the globe. It traveled 37,000 miles -- without a gallon of gasoline. It just took a while. "PlanetSolar is not a very fast boat," D'Aboville admitted. Its average speed is 5.5 knots -- the same as jogging a 9.5-minute mile. "We did 10 knots once, but if we do this we do not have power for a long time." Between its leisurely pace and multimillion-dollar price tag, the Turanor PlanetSolar isn't exactly practical, nor a prototype of boats of the future. D'Aboville entertains no fantasies of future seas filled with solar boats. "This boat is a wonderful ambassador for solar energy," D'Aboville said. And then, smiling: "I will not pretend that tomorrow's commercial boats will be driven with solar energy." While the boat may not change water travel, it is an effective -- and attention-grabbing -- demonstration of the sun's power. "The boat weighs 100 tons. So 100 tons have been circling the world only with solar energy, which is really a big achievement." It's not just a floating advertisement for photovoltaic harvesting. In its latest incarnation, the Swiss boat has also served as a research vessel. During its current tour of the East Coast, scientists from the University of Geneva have utilized the ship's unique qualities to study the Gulf Stream. Anh Dao Le, a researcher at the University of Geneva traveling on the boat, explained that a motorized boat with no carbon emissions minimizes the risk of distorting her team's measurements with pollutant gasses. "There's no outside parameter input into the water mass that we are measuring." Plus, Dao Le added, a trip powered by solar has its benefits. "We try to understand the natural systems with the natural energies," she said. "Wherever you have the sun, you can continue your journey." And prototype for future or not, the PlanetSolar boat is a marvel to behold. It's equipped with a kitchen, 6 cabins, and 9 beds. When docked, it can fit 60 people. Its electric motor has an output 120 kilowatts. For comparison, captain D'Aboville estimated that a washing machine takes one to two kilowatts. "We could have a lot of washing machines on board," he said laughing. Alexander is a digital reporter for CBSNews.com. He previously worked as a multimedia reporter for POLITICO, where he covered the 2012 presidential campaign.